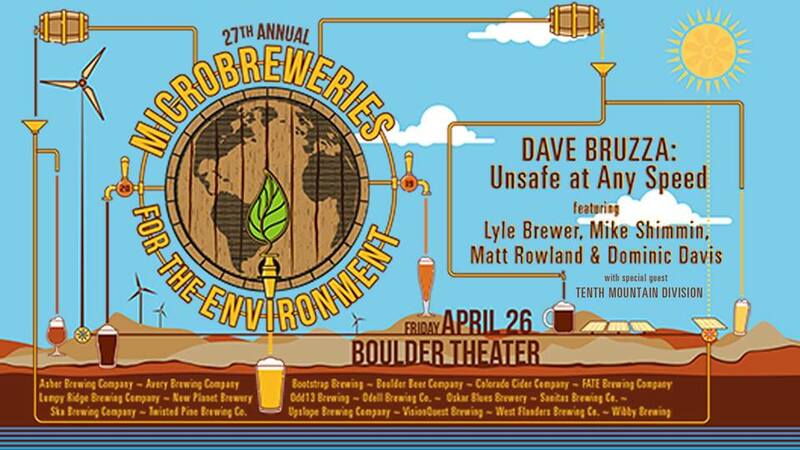 Every Spring at the Boulder Theater, Colorado Microbreweries donate staff time and beer to support local environmental organizations. Since 1993, the Microbreweries for the Environment benefit has raised over $200,000 for local environmental causes. Admission includes a commemorative pint glass for unlimited tastings, and all you can responsibly drink. Featured Breweries: Asher Brewing Company, Avery Brewing Company, Bootstrap Brewing, Boulder Beer Company, Colorado Cider Company, FATE Brewing Company, Lumpy Ridge Brewing Company, New Planet Brewery, Odd13 Brewing, Odell Brewing Co, Oskar Blues Brewery, Sanitas Brewing Co., Ska Brewing Company, Twisted Pine Brewig Co., Upslope Brewing Company, VisionQuest Brewing, West Flanders Brewing CO. & Wibby Brewing.